The guide has been updated from all the field work through 10/4/2016, but the text on this page has mostly not been updated, and a lot of it is very out of date. Fig. 1. Google Earth view looking east of the first part of the Cactus Spring Trail, with some landmarks labeled. Click on the picture for a larger version. And what a delightful trail it is! It traverses absolutely beautiful country, beginning at an elevation of ~4045 feet. Surprisingly, the trail travels along drainages for most of the distance to Horsethief Creek. In fact, much of the trail is indistinguishable from a drainage, so one has to be a bit alert when the trail briefly leaves a drainage to go to the next one. The only real non-drainage sections in the portion up to Horsethief Creek are the saddles between drainages. As a result, the trail has significant ups and downs all along the portion to Horsethief Creek. The net elevation gain going to Horsethief Creek and back is ~1165 feet, not the (net) elevation difference of 900 feet quoted in Ferranti's 100 Great hikes in and near Palm Springs, 2000. It is very surprising that any guidebook would quote the misleading net elevation difference instead of the elevation gain and loss one actually experiences while hiking a trail. Past Horsethief Creek, the trail briefly ascends a ridge before joining a beautiful wash which leads most of the way to Cactus Spring. This trail is remarkably rich in species. There are 203 taxa found on the trail itself, and an additional 25 taxa are found just off-trail along it. The richness is due to two main factors. 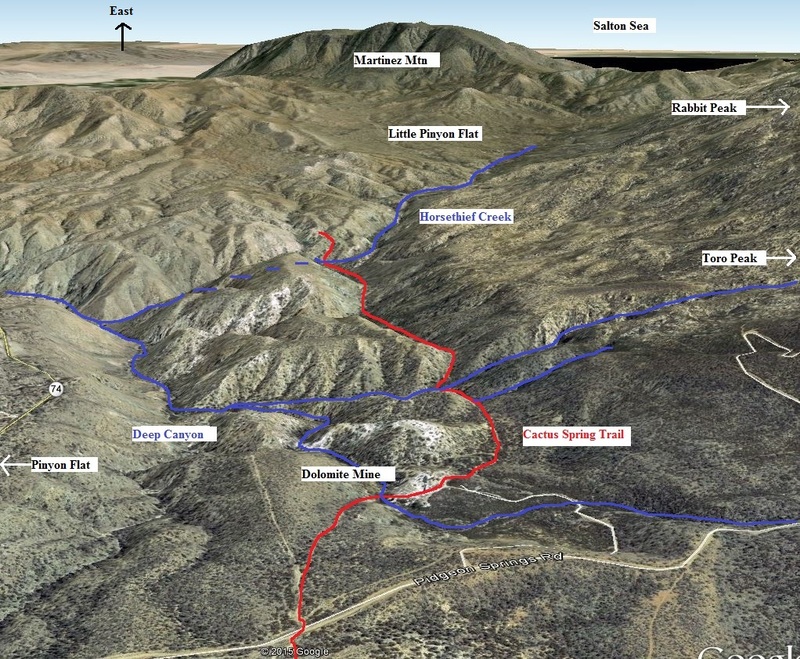 First, the trail contains both low-elevation desert species and higher-elevation montane species, due to its elevation range of 3480 to 4200 feet. The desert species are near their upper elevation ranges, and the montane species are near their lower elevation range. Second, the trail samples many different habitats, including slopes of all aspect ratios (north, south, east and west facing slopes), flat areas, and riparian areas. For a number of beautiful photographs of species in bloom on this trail on 2 May 2008, see Michael Charters' photo gallery. The trailhead is 8 miles east of the junction of SR74 and SR371, and is well-signed on SR74. Go south (right if coming from Hemet or Anza) at the sign for 0.4 mile, then turn left onto the wide dirt road. Park in the flat area north of the trash disposal. The class A parking lot, with space for zillions of cars and with a beautiful wood railing all around it, is signed "Sawmill Trailhead". The parking lot is immediately north of the Riverside County trash transfer station, so if you park and see lots of dumpsters to the south, you're in the right place. There is a sign at the southeast end of the parking lot that point you toward the Trail, via the southernmost road to the east. Don't take the potentially-confusing "Elk trail", which is simply the driveway to the Elks Lodge, which, for some reason, is just past the northeast corner of the parking lot. It is 0.15 miles from the east edge of the parking lot to the signed Cactus Spring Trail. This guide begins at the fire hydrant 0.02 miles past the southeast end of the parking lot. From the parking lot to Horsethief Creek and back is 4.74 miles roundtrip, with 1165 feet of elevation gain and loss. Of the 1165 feet, 300 feet is gained on the way out, and 865 feet on the way back. From the parking lot to the creek just beyond Cactus Spring and back is 9.86 miles roundtrip, with 1920 feet of elevation gain and loss. Of the 1902 feet, 1055 feet is gained on the way out, and 865 feet on the way back. There are twenty taxa found only here and not in any of the other 127 plant trail guides we've done in southern California. There are an additional twenty taxa found only on this trail and one other plant trail guides. There is a marble bedrock area on the trail, which is also unusual in southern California. So far, there are no local endemics found on it, although one taxon comes close. Sarcostemma crispum is a disjunct from Arizona which lives only in the Pinyon Flat area. The correct determination of these plants was not known until 9 June 2009, when Jordan Zylstra figured them out. For one full year previously, Jordan and I discussed how weird these plants were by email. These plants have a green corolla, and large crisped dark green leaves unlike any Sarcostemma we'd ever seen. However, since S. cynanchoides has been reported to have a green corolla in Utah and Arizona, I thought these plants must be that id, since the anther head is free of the corolla ring. But on 9 June 2009, after I sent Jordan links to pictures of S. cynanchoides in Utah and Arizona, Jordan examined pictures of other Sarcostemma species that lived in Arizona, and found the true determination for the plants here. As a result of Jordan's work, this species was added to the Second Edition Jepson Manual. The following histogram gives the number of trails in our database that contain each taxon on this trail. We had 128 trails in our database when this histogram was made; 2 of those trails, including this one, are in this area of Santa Rosa Mountain. A number of "1" means the taxon has only been found on this trail among the trails in our database; numbers of "2" or smaller may indicate taxa found only in this area of Santa Rosa Mountains. We found 3 additional species not in the above table, since they have not been fully identified yet. The unidentified ones are marked with ? or sp in the id? column in the guide, and have no entries in the #all column. The fieldwork on 10/31/06 was only to mile 1.18. There are thus two entries for 11/12/06. The first gives the results only up to mile 1.18; the second gives the results to mile 1.43. Similarly, there are two entries for 11/16/06, which was the first time the guide was extended to Horsethief Creek, and for 5/28/08, which gives the results for the first the guide was extended from Horsethief Creek to the Creek just beyond Cactus Spring. The numbers were not recorded separately for 4/30/08 and 5/24/08. Most of the new taxa reported on 5/28/08 came from those two previous trips. The column #Pls gives the number of plants of each species on and in the area of the trail, and the number of distinct locations along the trail that contain that species, up to a maximum of 99 plants and 9 locations. Many of the numbers used the old convention of only counting plants within an arms-length of the trail, but some of the numbers include plants that can easily be reached from the trail. Some species do not yet have abundance estimates; that column is either blank for those species, or contains an x. The Scientific Name is mostly in the Second Edition Jepson Manual system. See also Checklist of the species in traditional family order, which contains links for every species to the Jepson Manual treatment and to Calphotos. The mileages up to mile 2.3 in the guide have been fit to Topo!, which probably means the mileages are a bit on the low side. Mileages post mile 2.3 come from a detailed GPS recording of the trail, but the GPS readings were not terribly accurate due to signal multipath from the many exposed rocks in the area. Begin trail guide just past southeast corner of parking lot, at fire hydrant; elevation ~4045 feet (1233 m). 0.00 r Signpost: "Please stay on designated routes only"
0.19 r Sign: "Cactus Spring Trail 5E01 (ahead); Sawmill Trail 5E03 (right)"
0.20 r Display board: "Cactus Springs Trail �"
0.22 r Sign: "Bikes prohibited in Santa Rosa Wilderness"
The following species are found in the drainage off-trail, and could well appear on trail in some years. They are given in alphabetical order by scientific name. 0.56 Enter marble area and the so-called "Dolomite Mine"
0.83 r Jct. road; sign: "Be prepared for hazardous conditions beyond this point"
0.88 Second of two minor local high points on trail; begin steep downhill - watch your footing! 1.17 l Sign: "Santa Rosa Wilderness"
4.45 r Y-jct; stay right; Sign: "Trail"
Gutierrezia sarothrae. See Gutierrezia californica and G. sarothrae. Opuntia phaeacantha. We are not clear whether the common prickly pear here with large pads is O. phaeacantha or O. vaseyi, or something else. The plants appear different in gestalt from the O. vaseyi at the Santa Rosa Plateau, and online vouchers for this area are all of O. phaeacantha. Not a single flower out of hundreds observed on this trail has the white filaments of O. phaeacantha. The filaments are mostly pure yellow, but some filaments are green, yellow and green, or reddish-salmon. This wide range of colors is typical of O. vaseyi. Also, an examination of the glochids on 11/12/06 found that they were absent from the areoles on the pad surfaces on the single plant surveyed, similar to some of the O. vaseyi plants at the Santa Rosa Plateau. Furthermore, the fruit inside color is purplish/red, typical of O. vaseyi, and not the green color of O. phaeacantha. The spines are flattened at the base, again typical of O. vaseyi, and not O. phaeacantha. The pads in general are too narrow to be those of O. engelmannii, and the plants don't have the more-erect habit of O. engelmannii. We have just gone with the voucher flow and called these plants O. phaeacantha until we get a better understanding of these plants. Eriogonum davidsonii. We have not observed blooms on the plants at the trailhead, but have a positive determination from blooms and leaves at mile 0.78. The plants at the trailhead look like they are the same species, but only the inflorescence will tell. Eriodictyon trichocalyx var. lanatum. Nearly all the plants on the trail fit this taxon well, except for the plants on the dolomite at the Dolomite Mine. Those plants at one location at the Dolomite Mine have a very hairy upper leaf surface, more like that of E. crassifolium. However, all those botanists familiar with E. crassifolium var. crassifolium say that these plants are not that taxon. Possibly these plants are E. crassifolium var. nigrescens; or possibly they are hybrids between E. crassifolium and Eriodictyon trichocalyx var. lanatum. This taxon is close to E. crassifolium var. nigrescens, and the plants here in fact key to that taxon using most keys. However, the upper leaf surface is glabrous to hairy, which matches the Jepson Manual description for E. trichocalyx var. lanatum and not E. crassifolium var. nigrescens. Monardella nana ssp. arida, Galium andrewsii ssp. andrewsii. These two species are intimately associated on this trail. Except for a small number of occurrences of Monardella nana, if you see one of these species, you'll find the other within a few feet. Lupinus concinnus. The specimens on this trail look very different from most plants of L. concinnus we have seen. When a specimen looks so strikingly different from the low desert version that one cannot even recognize them as L. concinnus at times, it sure seems like there ought to be some split into at least subspecies. The problem, according to the Jepson Manual treatment, is that the named varieties are "+- indistinct" and they "need study". L. pallidus = L.c. ssp. pallidus, which has flowers "pale blue to whitish or yellowish", 5-7 mm long, and mostly appressed hairs. Most of the specimens on the trail have the appressed hairs of ssp. pallidus, but the flower colors are pink to blue to purple, which is a mix of both subspecies. Hence it appears that the Jepson Manual treatment got it right. Quercus acutidens = "Q. not-engelmannii. Quercus wislizeni var. frutescens. This specimen has an arborescent form, with three main trunks. Artemisia dracunculus. These specimens have a number of deeply-lobed leaves, extending well up the stem. We have seen this in specimens at Volcan Mountain as well. We thank Jordan Zylstra for the correct determinations of Sarcostemma crispum+ and Leptodactylon pungens plants on this trail. We thank Bruce Watts for discovering the Amaranthus palmeri on this trail. We thank Ted Caragozian, Kate Harper and Jim Roberts for their help with the 14 February 2014 survey. Checklist of Cactus Spring Trail in traditional family order. Copyright © 2006-2017 by Tom Chester, James Dillane, Dave Stith, Kirk Anderson, Keir Morse, Kay Madore, Erik Blume and Anne Kelly.